little momma and company: my own willy wonka. 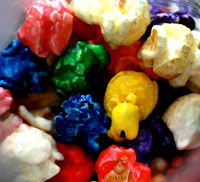 When I discovered the little popcorn shop downtown, I knew I was in trouble. From the instant I walked inside and was hit by the buttery, sweet smell-- I was in love. Flavors upon flavors, colors upon colors. The choices make me dizzy! Every time I venture in and press my nose up to the carnival of colorful cases, my mind has flashbacks to scenes from Charlie and the Chocolate Factory. The spinning colors, the tall glass jars spilling at the brim, the welcoming aroma found in every nook and cranny in that lovely little store. Choices, choices, choices! Grape, watermelon, banana cream pie. Loaded potato, jalapeno, pizza! I've found my favorite though. C o r n f e t t i. This little concoction boasts all of the fruit flavors piled into one tidy spot. A little bag of happiness, all for just over $2. I love it so much, I bought a 20 pound bag of it for my dad for Christmas and sacrificed the space in one whole suitcase on our flight out to AZ. I had to roll each and every article of clothing to make it fit just right, and even then my favorite shoes had to be left behind. Now, that's sacrifice. All in the name of cornfetti. Now, I really know I am addicted. I knew I still had half a bag left, but I could not find it! I searched everywhere. High and low. Low and high! And then I found it, in the most embarrassing of places. 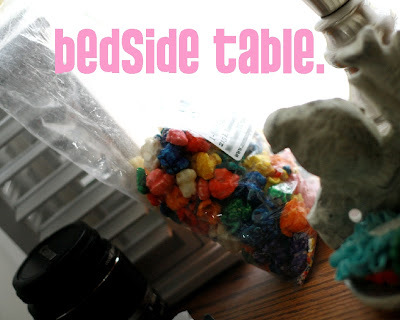 I think the bedside table is the perfect place. :) So fun, the colors. We need a store like that here. 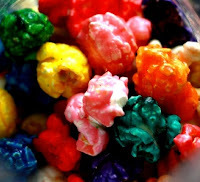 We used to have a popcorn/snack shop in the mall and it sold cheddar popcorn that I LOVED. And while we were in Disneyland we tried the chocolate covered caramel popcorn....mmmmm...goodness. Mmmm! 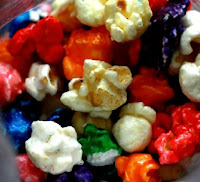 I can't remember who in our hometown used to bring over multiple flavors of popcorn every single Christmas. I'll have to ask my Mom. But oh, it was so good! I've been making kettle corn around here. Planning to put up a post about it in a few days. Mmmmm. So addictive! Thanks for sharing the beautiful pictures and mouthwatering description! WOW! Look at all those colors! Your description reminds me of those Harry Potter candies (can't remember what they're called) that come in EVERY flavor. I love Mom and Popcorn too :) The best treats there! i would buy it just for the color! yum! oh I would be all over that place!! 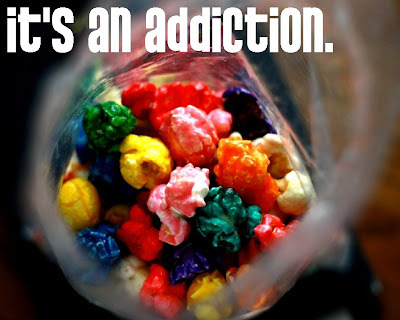 I loooove kettle corn, I buy a bag and eat it in one day. During the summer/fall I get it fresh, but it is not colorful or come in as many flavors as yours. It was so yummy and I'm glad you made space for it. That big space was more then filled on your return trip. Haha! aw man...that takes me back to a little shop that was down the street from my grandma's house. we would walk there everyday after kindergarten and get flavored popcorn and a sno-cone!!! i sure wish that shop was still around! wild goose chases, and the reasons for them. when my hands work together. the first pop of spring.